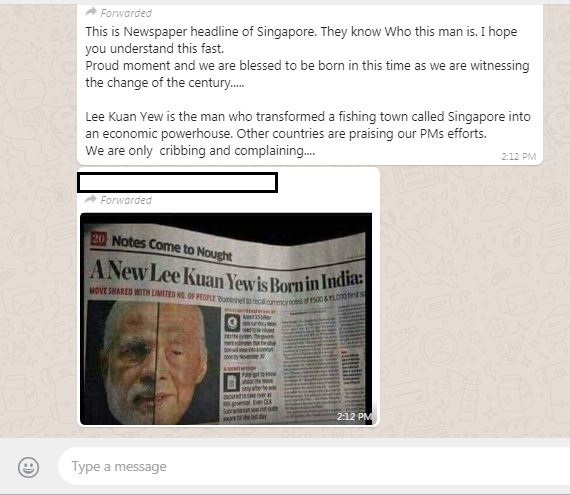 No, a newspaper in Singapore did not say ‘a new Lee Kuan Yew’ is born about Prime Minister Narendra Modi. 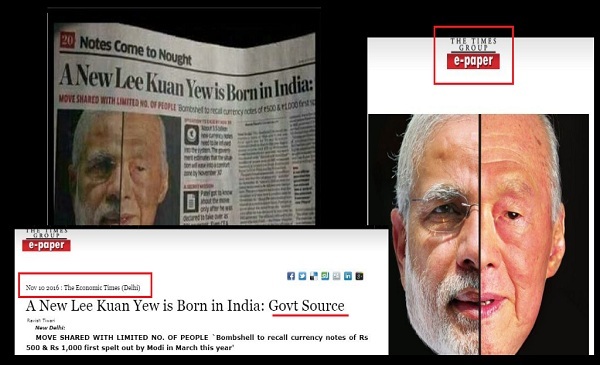 Viral social media posts showing a picture of a news article with a split face of Prime Minister Narendra Modi and Singapore’s late founding father Lee Kuan Yew with the headline ‘A New Lee Kuan Yew Is Born In India’, is misleading. The image has been craftily cropped to exclude the words ‘Govt Source’ out of the headline making it seem like a standalone headline given by the newspaper rather than a quote by an unnamed Indian government official. 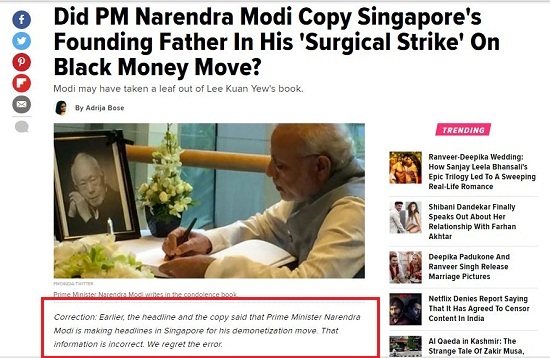 Furthermore, text with the photo claiming that a newspaper in Singapore had said the same about the Indian prime minister is also false as the original article including the photo was created by an Indian business newspaper, The Economic Times just days after demonetisation in November 2016. The cropped photo that went viral even in 2016 and was carried by fake news and propaganda website Postcard News has made a comeback on Facebook and WhatsApp in the past week. The Economic Times’ 2016 story by journalist Ravish Tiwari said the decision to scrap 500 and 1,000 rupee notes was spelt out by Prime Minister Narendra Modi in March that year (2016), citing “highly placed sources”. The article quoting unnamed government sources said select few within the government and Reserve Bank of India were privy to the plan to initiate the step of demonetisation. The Economic Times’ article attributes the metaphor ‘a new Lee Kuan Yew is born in India’ to an unnamed official within the Narendra Modi government. Below is an excerpt from ET’s story. Click here to view an archived version. 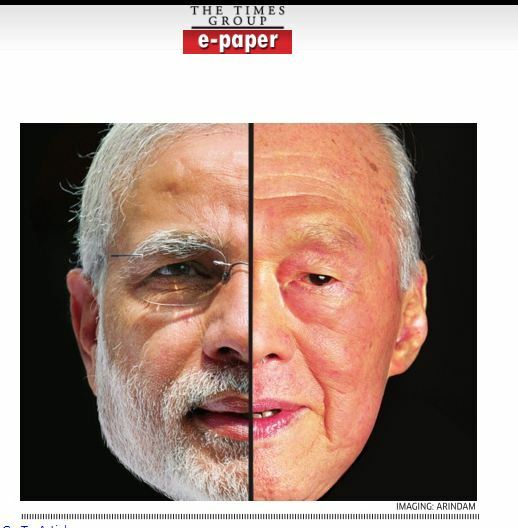 The image of a split face of the two leaders also appears to have been created by the newspaper as the image includes a photo credit to ‘Arindam’, at the bottom right. 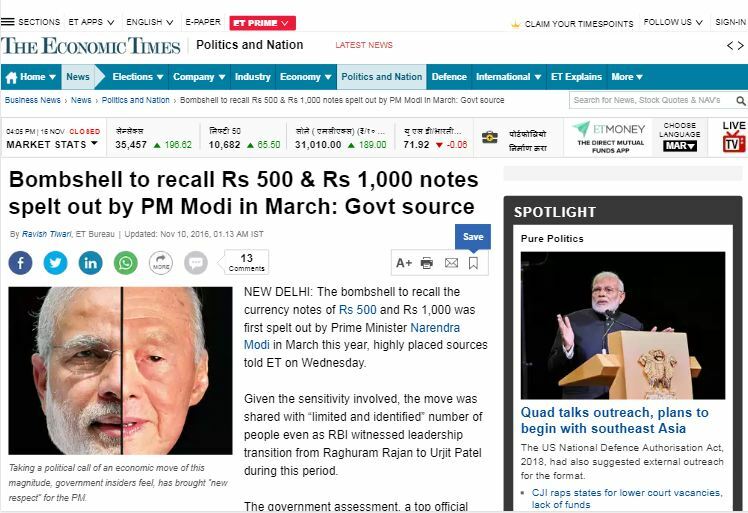 The newspaper changed the headline of the story later to ‘Bombshell to recall Rs 500 & Rs 1,000 notes spelt out by PM Modi in March: Govt source‘ However, an archived version of its home page showing the original headline can be viewed here. 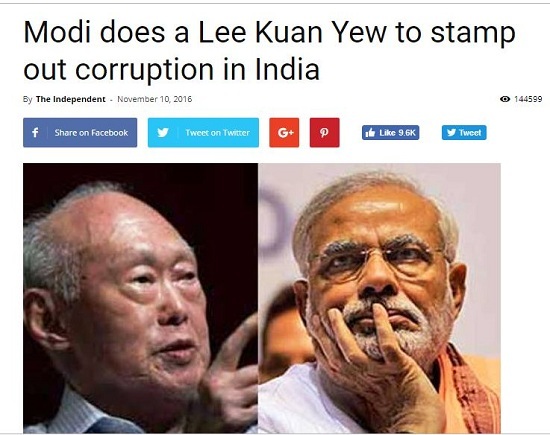 On the same day (November 10, 2016) Singapore-based website The Independent’s headline ‘Modi does a Lee Kuan Yew to stamp out corruption in India‘ was reported by a few Indian media outlets such as Zee News . It was also mentioned by moneycontrol.com in 2017. 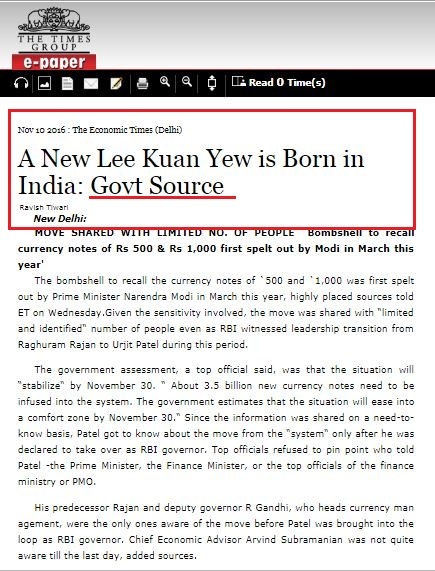 However, The Independent appears to have republished the unnamed Indian government official’s quote about ‘A new Lee Kuan Yew is born in India’ without crediting The Economic Times. While The Independent’s story is only six paragraphs long, The Economic Times’ story is a detailed piece quoting government insiders on demonetisation. The Singaporean website is not related to the British newspaper of the same name. 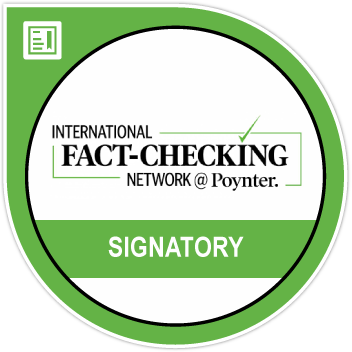 Separately, a correction made by The Huffington Post India in 2016 throws light on the confusion in India about the reportage on demonetisation in the Singaporean media. “Correction: Earlier, the headline and the copy said that Prime Minister Narendra Modi is making headlines in Singapore for his demonetization move. That information is incorrect. We regret the error.” – The Huffington Post. The founder of modern Singapore, Lee Kuan Yew is credited for transforming the tiny island from a colonial trading post to a hub of modernity, efficiency and an economic model for its Asian peers to emulate. Prime Minister Narendra Modi’s admiration for Lee Kuan Yew is also well known. The prime minister had called him a ‘lion among leaders’ when he tweeted condoling Lee’s demise in March 2015. Does Narendra Modi Track Twinkle Khanna on Twitter?